Clearing is beginning in earnest. The wind thoroughly ricketised my runner bean poles so they had to come down. The beans are yikky now anyway – who wants tough beans?! The tomatilloes are out too, and as with the beans, are all chopped up and in a dalek for compost. 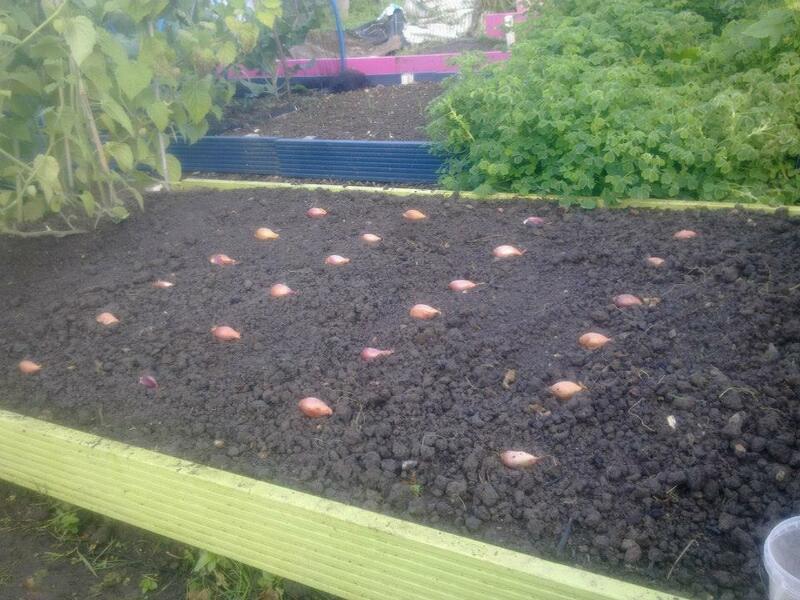 I dug over the ground they were in, which is incredibly dry despite the almost constant showers over the last week, and put the Jermor shallots in their place, 4 rows of 6, netted against the birds. Have left the cape gooseberry triffids in in case the rest of the fruits have a chance to ripen. They are just too good! Checked on the saffron and 54 of the 60 bulbs are poking through, about a third with more than one spike showing. 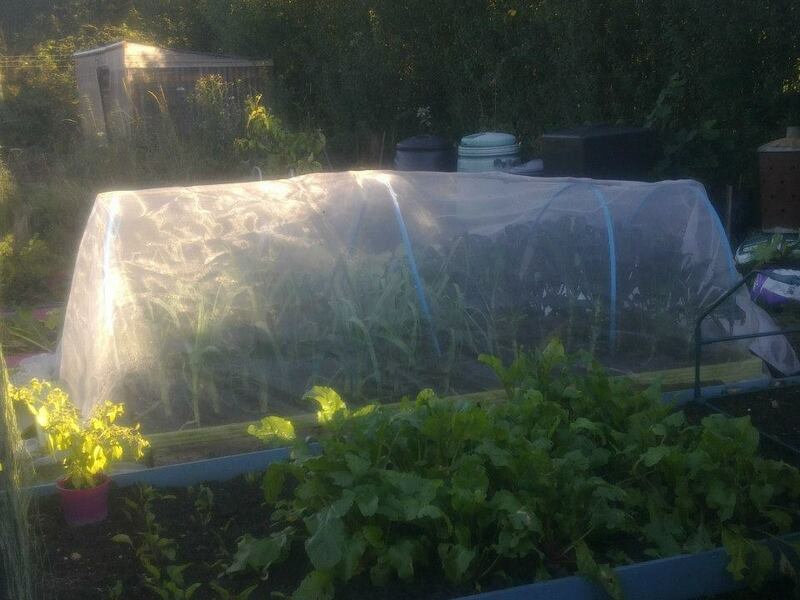 I also raised the hoops on the leek/kale bed by about a foot so they have a bit of head space. 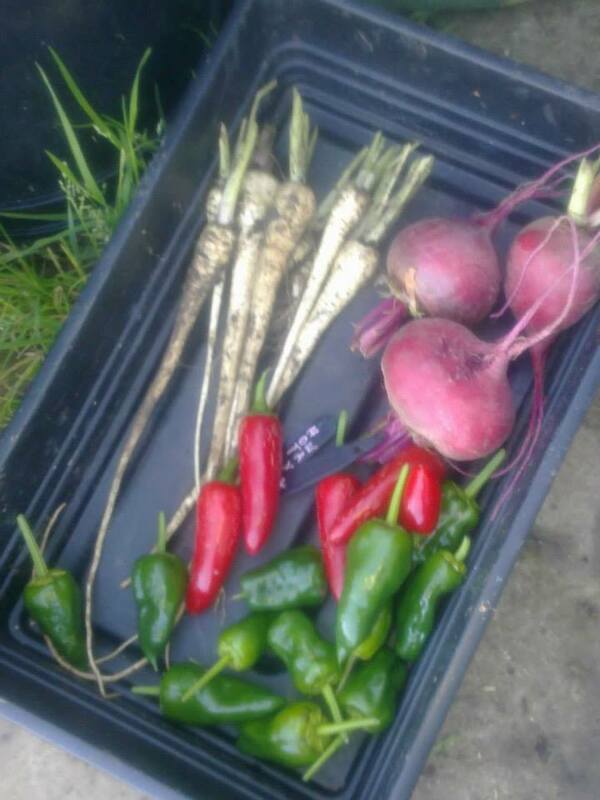 Harvested tomatilloes, the last of the tomatoes, kale, beetroot, 6 pathetically tiny parsnips (tasty though! ), padron peppers, achocha, chillies, cape gooseberries and took home the other squash. 2 butternuts left on the vines on site for as much ripening as possible. Tried & failed to pull out some salsify. The leaves all came off in my hand. D’oh. I roasted one of the Potimarrons last night – it was absolutely gorgeous and tasted very much of chestnuts. Piero was gratifyingly amazed at how good it is. I spent a happy half hour going through the orange goo from the middle to get the plumpest seeds out for saving. It’s oddly satisfying and there is a plate of washed, cleaned seeds now drying in the kitchen. The other one is also hand-pollinated, so I should have loads.